For every bit of Fuller House news that’s broken, there’s been an attendant catchphrase from the original sitcom with which to sum up our reactions. “No way, Jose!” burst from Netflix subscribers’ lips upon hearing that the sequel series was in development, followed by a “how rude” in response to the production’s repeated attempts to lure Mary-Kate and Ashley Olsen’s into taking the questionable nostalgia trip. Then, when Fuller House opened its doors, the Tanners’ underwhelming return elicited a “cut it out” from The A.V. Club’s Joshua Alston. After debuting a second treacly season of post-mourning cohabitation, we‘d hoped that Netflix would have mercy on us all—it is the holiday season—and just let sleeping Comets lie. 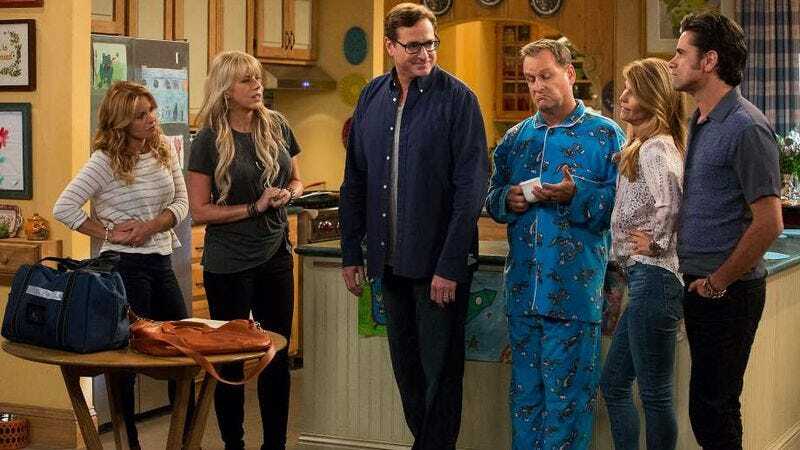 But, just like that guest who brings an unwanted/inedible fruitcake to every holiday gathering, Netflix has decided to offer its viewers a third season of Fuller House. The Tanner-Fuller-Katsopolis clan plays hot potato with the latest renewal before leaving Stephanie (Jodie Sweetin) holding the bag. It really stinks to be the middle child in that family.